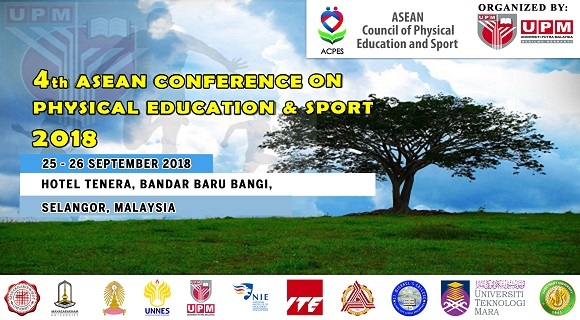 All participants must register using this link: http://submit.confbay.com/conf/acpesmohe2018 including those who only want to attend but not present paper. The Conference Committee is now calling for abstracts. The major themes of the conference are listed below and parallel sessions will be arranged according to these themes. Please take note of the submission guidelines listed below. Selected papers written in Malay or English will be published in the Movement, Health & Exercise Journal (MOHE). This journal is currently indexed in MyCite, Google Scholar, ROAD, DOAJ, J-GATE and Index Copernicus. This journal can be accessed through the following link www.mohejournal.com (Author Guidelines for Publication in MOHE Journal). Please indicate on your abstract whether you would like your full paper considered for the refereed journal publication. Presentations can be conducted either in Malay or English. Presentation at the conference does not guarantee that the paper will be selected for publications. To be considered for the journal, a full version of the paper must be submitted at the conference. Late submissions will not be accepted. The journal will be made available after the conference. Awards will be given for best paper presentation (English & Malay) and best poster presentation.